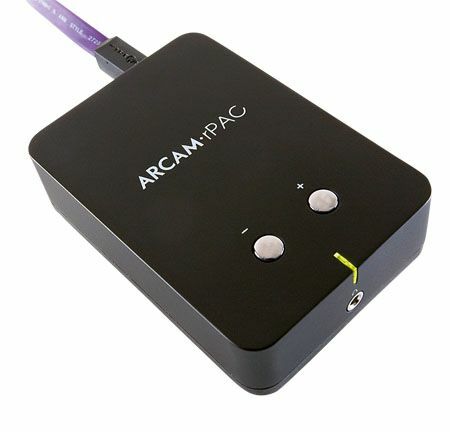 Arcam rPAC review | What Hi-Fi? Arcam has assembled a potent portfolio under its ‘r’ umbrella. There’s the rCube speaker dock, rDAC digital-to-analogue converter, rDock standalone iPod dock, and now this bijou box of tricks, the Arcam rPAC. of an external DAC with the convenience of a headphone amplifier. As such, it’s really meant for use with a desktop PC or laptop, hence the solitary type-B USB input on the rear. Sample rates up to 24-bit/96kHz are supported the aforementioned socket. Your headphones’ 3.5mm jack slots into the socket on the front of the device, while you can either tap or hold the buttons on top of the rPAC to change the volume. Or, you can use the phono outputs next to the USB socket to feed the signal straight into a stereo amp and on to a pair of speakers. Because the rPAC is USB-powered and only weighs 300g, it’s compact enough to slip into a bag or briefcase. So, provided you remember to pack a pair of headphones (and your laptop! ), you can piece together a neat portable audiophile system. Of course, all this potential is pointless if the sound isn’t up to scratch – but the rPAC doesn’t disappoint. The difference between using one of these and your computer’s internal DAC is night and day. Play the Red Hot Chili Peppers’ Can’t Stop and the impression of depth and spaciousness around vocals and instruments is excellent. The transparency on offer makes for a detailed and insightful sound. There’s a sense of immediacy and snap to each snare-drum thwack, with the rPAC delivering plenty of weight although some may find the presentation a touch too smooth. Switch from using the headphone socket to the stereo output and the rPAC shows the same sonic character and consistencies. Alicia Keys If I Ain’t Got You sounds natural, her piano play fluid and intoxicating. However, with newer options on the market the rPac loses a touch of its desirability. Audioquest's Dragonfly offers a more attacking vibe while HRT's microStreamer goes that extra mile in revealing a subtlety and depth. More desirable alternatives exist but the rPAC’s flexibility, sound quality and affordable pricetag tick all the ingredients for a seriously tempting product.